Tony Condon is our Advisor and Factory Rep for our line of Hall Cherokee II kits. For those of you who don't know Tony he recently restored and flies 373Y. That is Tony below with 373Y. Tony will be posting his Cherokee pictures and experience here at his blog "The Tony Condon Project" and be available for technical support and commentary. Make sure you bookmark his blog and join in the conversation via the comments. Well we got a great day of work in on 53T today. We moved the glider over to the new garage on Friday but yesterday we didn't have a chance to get any work done out there. It was cold, rainy, and windy. However the wind flipped around to the south today and brought 80 degree temps that could not be resisted! My first order of business was to get the new top stringer installed. The old one was removed as it was pretty warped and generally made the glider look lousy. We ripped a new piece a few weeks ago off a long board of Douglas Fir. It didn't take too long to get it trimmed to shape to fit nicely into the glider. Here the epoxy has cured, Leah is in the background cleaning all the dirt and grime out of the left wing. It was a job that was really needed and greatly appreciated. With some water and Murphy soap the wood is looking brand new! We did find some additional damage from the mice nest that was in the left wing however. In wing bays 12, 13, and 14 there is damage to the forward spar. Apparently mice have a taste for aircraft quality spruce. We are not Mickey fans around this house. We much prefer Goofy since he was a glider pilot. So here are some pics of the damage. Will have to check with the local experts on the best repair route for this. Might have to remove the skin and do some scarfing. We'll see. Other work accomplished today was hanging the tail from the ceiling which will make it a lot easier for me to remove the rotten wood back there. Leah did get the left wing cleaned up really well which is great. I also did a bunch of cleaning up and sanding where the center section meets the fuselage. I also added some poly-fil filler to a couple stringers that had gotten damaged when we removed the fabric. I'll be doing more poly-fil work to fillet the intersection between the wing root and fuselage in the next couple days. Other main short term goals are to get the rotten wood cleaned out of the tail and get the right wing cleaned up. The blog should be much more active now that the glider is here at the house, so keep checking back for updates! Last night it was a balmy 44 degrees in the garage so Leah and I did a little work. The main thing I did was cut out the top stringer on the fuselage. It had warped between its supports from years of doped fabric shrinking down on it so we decided to replace it with a nice straight piece of wood. It came out pretty cleanly, just a little work with a chisel and i should be ready to glue in a new piece. I also went around identifying areas that need our attention and marking them with tape so we don't forget about them. There are a few stringers that got damaged when we got a little too excited removing the fabric. The lower longerons are covered with a quarter round piece of balsa to give the fabric something smooth to slide over and in a few places this got torn up too. There is one support between the lower stringer and the fuselage truss that is no longer attached to the truss which will need re-epoxied. There is one stick on the root rib of the left wing that needs re-epoxied. The rest of the left wing looks good as far as we've been able to see. On the right wing I found some issues around the airbrake area. The airbrakes are sprung shut on the Cherokee and the spring that does this runs from the bottom of the airbrake to the bottom of the rib that runs through that area. On 53T there was actually two small springs providing this resistive force which made it difficult to impossible to completely open the brakes. I'm going to use this to excuse my long landings when i flew the glider. Anyway with that extra force, the rib started to twist over the years and broke the glue joints to a couple of the vertical stabilizing pieces that span the rib. so that are will need some re-gluing. The right wing does not show any issues in this area so that is good. The only other issue with the glider is the rot at the bottom aft end of the fuselage which I think I've already written about that. I have some pictures but they're still on the camera, will try to get them uploaded soon. In other news Leah and I are getting close to closing on a 36 x 36 garage with detached house. 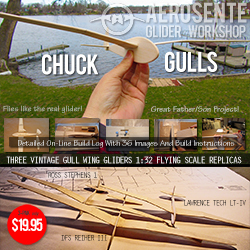 Should make a great workspace for the gliders. Especially after it gets heat! We will be at the SSA Convention in Philadelphia at the end of the month so if you're planning on attending let me know, we're looking forward to a good time catching up with soaring friends. I bought an Oudie this winter and an LX Nano flight recorder. High technology for an old glider but I think it will be well worth it. I was flying with a loan Cambridge 20 GPS last season which was great. I loved having the GPS display and having the flight logs after each flight for analysis and posting on the OLC. 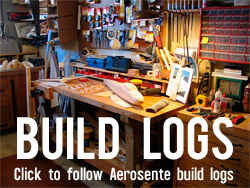 Not to mention being able to turn in the logs for my Gold Distance and Altitude. I've got Diamonds on the mind now so having an IGC logger was a must and the Nano seems to be a great value. It can interface to the Oudie for a really compact and portable system. I just got the Oudie hooked up to my old PC a few days ago and have been playing around on Condor soaring simulator with it to learn the ins and outs. Still trying to determine what I want to do this summer. I'd like to fly 373Y in a regional contest somewhere. The closest so far is in Moriarty, NM but the dates conflict with previous plans so I won't be able to make that one. Hopefully something will turn up in Texas. Otherwise I'm kind of thinking about going to a ridge camp in Jasper, TN in late March and then returning to Chilhowee for the Region 5 contest in September. Also will probably spend Memorial Day at Ulysses again (perhaps ground crewing for Leah in 53T if it's done) and also might try to take 53T to the Vintage Nationals in Lawrenceville, IL in June, once again if it is complete. So, we'll just have to see how the schedule plays out. Today was relatively warm so Leah and I got back to work. The knifes came out and the fabric started flying. All in all the wings look good. Bud Brown used a solid trailing edge about 2" wide which is showing minimal warping. I don't think its enough for me to bother trying to get it any straighter. He also obviously spent a lot of time with (probably) epoxy filler on the leading edges and sanding to get them very smooth. We did find a good size mouse nest in the left wing but it didn't appear there was much damage associated with it. This wasn't completely surprising as we had found some evidence of mice during the condition inspection last summer. But the good news is these wings won't require much more than some sanding and a little wood sealant before they are ready to cover again! Ken Caldwell emailed me the other day bringing to my attention that there is Cherokee news to report from down under. The Australian Vintage Times newsletter reports that Cherokee VH-GLV has been purchased by Peter Raphael who is working to get it re-registered and airworthy again. I'll update GLV's roll call post with more info from the article but I was impressed to see that it has over 1300 hrs on it. This very well could be the highest time Cherokee II in the world. Ken also sent some pictures from the 1966/67 Australian Nationals in which -GLV competed. I'll put the story from the competition on the roll call post. Thanks Ken! Tonight Leah and I spent a little time in the garage (a balmy 44 deg F inside) and got pretty much all the fabric off the fuselage. All in all it looks to be in good shape. There is one stand off between the truss and the lower stringer that needs reglued to the truss. Also there are a few stringers that suffered a little damage when we got a little to carried away tearing off fabric. Should be no problem repairing that. The only other thing I noticed is that the epoxy filler that was originally used to fillet the intersection between the wing and fuselage managed to turn to a pretty weak powder over the years. Pulling the fabric off managed to pull up some of that so I see a little Super Fil in our future. Oh one other thing, I managed to bust off the tailwheel spring and the support and backing block. It appeared that there was no drain hole back there in the tail and based on the look of things it had gotten some water in there. So we'll have to rebuild that and come up with a new tailwheel setup. I didn't really like the other one anyway. Leah and I started discussing paint schemes for 53T yesterday. She took a look through my list of Cherokees and decided she liked a two tone scheme. I found a copy of Martin Simon's 3 view on retroplane.net and started playing around with different colors. Our current favorite is this Forest Green/Ivory combo with the two tone fuselage and opposite colors on the wings. For insurance reasons I have had to wait until I have my certificate before being able to fly Triple Tango. Not only was Monday's flight my first flight in a single seater but it was also my first solo flight in a glider besides the SGS 2-33. As fall is finally starting to catch up with Kansas I wanted to squeeze in a flight with my glider before the end of the season. She has mostly been sitting in the hangar gathering dust. Tony has flown her a few times along with our friend Pete at the Wichita Vintage Sailplane Association Rally and Tony's former student Luke, but mostly she has been patiently been waiting for me to be ready to begin our partnership. I was hoping to get my first flight with her in on Sunday but Tony and I arrived back in Wichita from Kansas City a little later than we had planned. We did get in some incipient spin training in the Cessna 150 as Triple Tango has a tendancy of dropping her left wing when stalled. Cherokee II's in general have a reputation for spins so it was really important that I got some extra training besides what spin entries we could coax out of the 2-33. Future plans include my getting some more training in a Lark sailplane with a friend who is an aerobatic pilot (and future CFIG student of Tonys....I get to be his guinea pig). On Monday I was able to line-up a tow pilot and Tony agreed to run my wing. First we had to empty out all the other gliders out of the hangar as Triple Tango was WAAAYYY in the back. After the extrication we got to work dusting her off so she would look good in front of the cameras I then performed a pre-flight and positive control check of Triple Tango. Tony performed my ground check out by introducing me to the cockpit controls. He then lifted up the tail to show me what attitude to expect from the glider upon landing. He positioned the glider with the tail on the ground, and with the nose on the ground as well. We then had to figure out the best place to position my ballast. 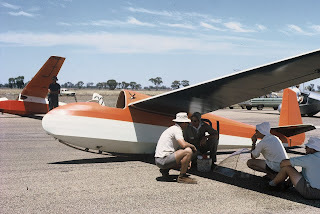 I was too tall with it in the configuration I use in the 2-33 with ballast (could not close the canopy). At 5'4" I never thought that I would be considered to be tall! The problem was solved by spreading out the weights and by removing the cushion under my "seat". While I felt a bit like the Princess and the Pea I was able to get full control movement, and the canopy shut! I was fairly nervous. Ultimately after enjoying myself sitting in Triple Tango on the ground Tony asked if I was ready. Truly the answer was that I was as ready as I'll ever be. 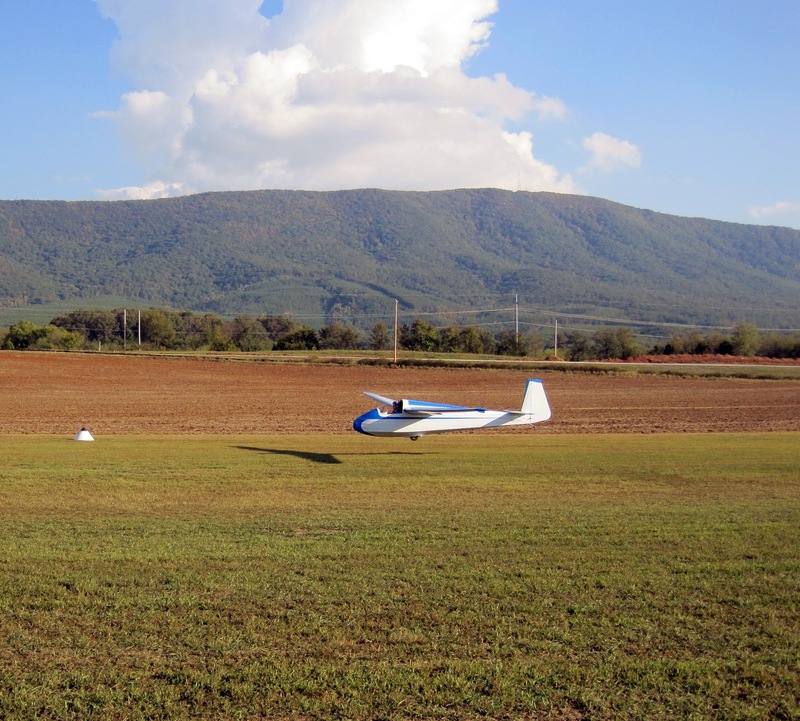 I felt like I had under gone all the preparations that I needed too and that I would not be completely ready until after the towplane started up with me in the glider. Tony stressed that I was going to lift off sooner than I would in the 2-33. He warned me that the pitch in Cherokee II's is more sensitive and that once I initially ballooned up I needed to level off there instead of trying to drop back down and risk PIO. Sure enough I popped up right away (even Tony was surprised) but I am proud to say that I managed to follow directions and leveled off without PIOing (is that a term?). Next I was surprised at how smoothly it flew on tow. The conditions were calm and there were not any thermals working, but it did not really require much pressure from me on the stick to keep it in position. In fact it was a bit unnerving to just calmly sit there with the feeling that I should be doing more but I managed to just let the glider fly and did not over control too much Tony told me to take a 3,000 ft tow and even with our 4:30 arrival at the gliderport, I knew that the maturing daylight was only going to allow me this one flight. Typically I take either 1,000 ft pattern tows or 2,000 ft tows so I felt really far up @ 3,000 ft. I released (which was interesting in and of itself as the release has very little movement compared to the yellow knob in the 2-33) and made a smooth turn to the right. Through out most of the flight I had to remind myself to relax. I was on my best piloting behavior and trying to do such a good job that I kept unconsciously tensing up. 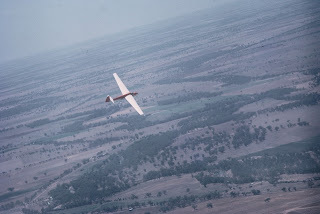 I just had to remind myself that I can fly gliders and that Triple Tango was just another glider. I worked on dutch rolls to get a feel for how she coordinated. Next I did some medium banked turns. Then while I still had the altitude I knew that I had to do some stalls. I am not a huge fan of practicing stalls in general. I know that it is an important thing to do, but there is just something in my nature that cringes inside every time I start to pitch up into a stall. My body is screaming that the nose is too high up but my brain has to reassure myself that I am aware of this and that it is intentional and then continue to pitch up. This time this feeling was intensified by the knowledge that I also had to be prepared for a wing to drop and to react to that. I did two stalls in a row. I did not stare at the airspeed indicator the entire time but the last time I looked before the stall, the needle was dropping under 30 mph. Sure enough as expected my left wing dropped once I reached the stall point. As soon as I felt/saw the wing drop I relaxed my back pressure and kicked in opposite rudder. I did not really give the wing the opportunity to develop any where near as sharp as in the C-150 but still I am proud of my reflexes. After stalls I made a conscious effort to slow my descent rate by slowing my airspeed down. While I was expecting that the quieter travel through the air (Tony had me open both air vents so I would have some noise) compared with the 2-33 I was flying closer to 60 mph so I dropped it down to 45 mph as after all I did not stall until below 30 mph. I then did some slower flight maneuvering. After this I figured I needed to practice slips. Stan Hall is known to have said that if he had to opportunity to design the Cherokee II over again he would have extended the air brakes out another rib. The air brakes are not very effective, Tony says they mostly just change the sound, so most landings are reliant on slips. This is where I made the first error of my flight (that I remember of course). While practicing slips, I focused more on the direction that my nose was pointing along with my track over the ground and not enough on my rate of descent while in the slip. This error was made apparent when I set myself up to land. I have a history of coming in a bit high and so landing a bit on the fast side. I set up the perfect pattern for either myself in the 2-33 for a no spoiler landing with wind....or myself in the 2-33 for a no wind, spoiler landing. Unfortunately neither of those conditions was the Cherokee II with no wind and weak spoilers. I realized that I was high when I turned to final and I just kept floating. I usually try to be around tree height when I pass over the road at the North end of the runway, and I was way above that. The only thing I could do was just to keep my slip in. When I transitioned from the slip to the flair I majorly ballooned upwards as the runway was rushing by underneath of me and I knew that I just had to keep burning off energy. In fact I was a little bummed that I hit tail wheel first (I was trying to land low energy/keep the flair) as this was something that Tony and I went over. Once on the ground I opened to full airbrakes (which I should have done sooner) to engage the wheel brake and let the glider drop to the nose skid. All told I had maybe 100 or so feet (Ok Tony says I had a few hundred feet left but to me it felt like I only had 2 ft left so 100 ft is the compromise) left of the runway before it went into the weeds. While I was a little frustrated about my poor landing (I was just verifying how long it was) I tried not to let that deter me too much from the rest of my flight which was fantastic! I could see the lights on over town which was pretty and the quiet solitude that I was up there with just myself and Triple Tango. This feeling was more pronounced than when I have flown the 2-33 solo. I did see 2 airplanes, one of which was a jet, a bit closer to me than I prefer (of course there would be traffic on my first Cherokee II flight) which made me more alert but there was plenty of room between us. Overall I walked away from the flight with a sense of what I need to work on once spring arrives. I plan on taking Triple Tango out to the 7,000 ft long Sunflower Gliderport and see many pattern tows to work on landings in my future This of course will only take place once Triple Tango has had her winter make-over completed. After recovering Tony's N373Y last winter, it is now N4653T's turn to have her 1964 original fabric replaced. I am hoping to have her ready for flight by mid April when we will continue to get to know each other. We've had 4653T for over a year now and really haven't done much flying with it. I have done a few high tows in it and Luke did his one flight in it but other than that it has been doing a lot of sitting and waiting. It has mainly been waiting for Leah to get her private certificate since the insurance company required a private pilot to fly the glider. Well on Saturday she passed her test so yesterday we got out of work early and headed to the Wichita Gliderport. Long story short Leah got one good flight in before sunset and landed with a smile! I'll try to get her to write up a report of the flight soon. Now that she has flown it, 53T will go back in the trailer tonight and sometime this week we will probably start cutting fabric off it for its recover this winter. and as always my email is abcondon@gmail.com if you have any questions or comments. had 373Y out at Sunflower on Saturday to make our attempt at the "Last Man Down" contest this weekend. Lift was weak but I did manage a 500 ft gain after release and then delayed settling back down long enough to get a 40 minute flight in. I wasn't last to land however but so be it. My former student Summer was very happy that she was able to stay higher than me in the club Ka6. She also took off before me and landed after me. Good job Summer! I remember when I first outclimbed my instructor, it was (and still is) a great feeling. Here is 373Y on the ramp at Sunflower. Steve Leonard standing by noting takeoff and landing times for the contest. This very well could be the end of our thermal season here in Kansas although i hope to perhaps take a trip or two to Talihina, OK this winter for some ridge soaring. Generally in that order, too. Leah is nearly ready for her Private Glider checkride and we hope to get her a flight or two in 4653T before it goes under the knife. 373Y has a fair amount of battle scars from a good season of soaring. I think I have about 46 hours on her this year. Scratches here and there mainly from trailer rash. Also I've noticed some bubbling on the leading edges. Consulting with Doug Stewart seems to indicate the technique I used to attach the fabric probably shrunk and partially sealed the fabric and didn't allow the glue to completely penetrate through, causing air bubbles to form. good news is some time with some glue in a syringe should take care of them. I received the following pictures from Jeff Stringer. This is 871Z, built by Bill Miller and owned at the time by Len McClain, founding member of the VSA. Len added the Cherokee nose art to 871Z. Pictures appear to be from Harris Hill, I suspect during a VSA Rally. That is the same nose art as 8722E. 871Z also had a clear finish on the wings at this time, which you can see in these photos. In other excellent Cherokee news, 10124 has flown! 10124 is the original Cherokee RM, built by Terry Miller and the Ree Brothers. The Ree's also built my 373Y. Den Barton, Bungee Cord editor, has been working for the last year or so restoring 10124. New fabric and paint and a sport canopy has been added. I'm still waiting for a detailed account of Den's flight(s) and will post if I hear anything. It looks GREAT! In RM related news, Matt Colclasure is working away on 1073. Now 1073 isn't an RM but Matt is facing having to rebuild the wing so is interested in the idea of maybe making it into an RM. He did manage to get ahold of Terry Miller but Terry has no plans sets for the conversion. He did give Matt as much info about it as he could remember however. If anyone out there has a set of RM plans please let me know!